Lately, I am all about one dish meals – they are simple, quick and I don’t have to wash many dishes. The last reason may sound like I am lazy…but really, I am without a dishwasher for the first time in my life and I’m still adjusting. Less complicated meals = less dishes, and that makes me happy 🙂 Not to mention, since Chris has been gone for a week, I don’t have the same motivation to make elaborate meals without someone to share them with. For some reason, I’ve recently been craving all things egg – scrambles, fried eggs, quiches, pizza etc. Apparently, I’m off my squash kick and moved onto eggs (and cookies/bars, but that’s for a different post) so if you see more recipes featuring this high-protein ingredient, you will know why! I love this dish not only because it’s fast and nutritious, but also it’s incredibly delicious. 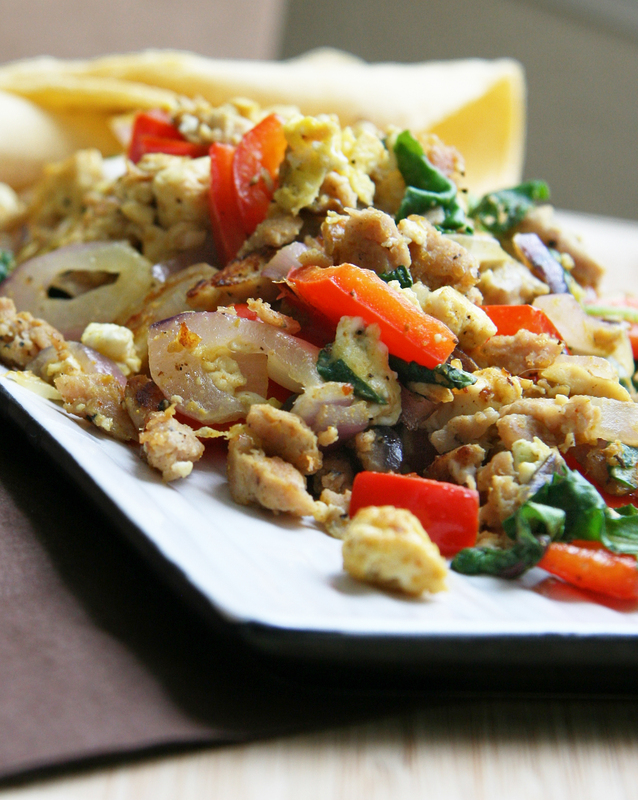 Start your day with a scramble packed with protein and vegetables or serve the mixture with warmed corn tortillas or a gluten free brown rice tortilla for a breakfast taco – you won’t be disappointed. You don’t have to save this for our morning meal though, I ate this for dinner one evening – breakfast for dinner anyone? For a vegetarian dish, eliminate the sausage. 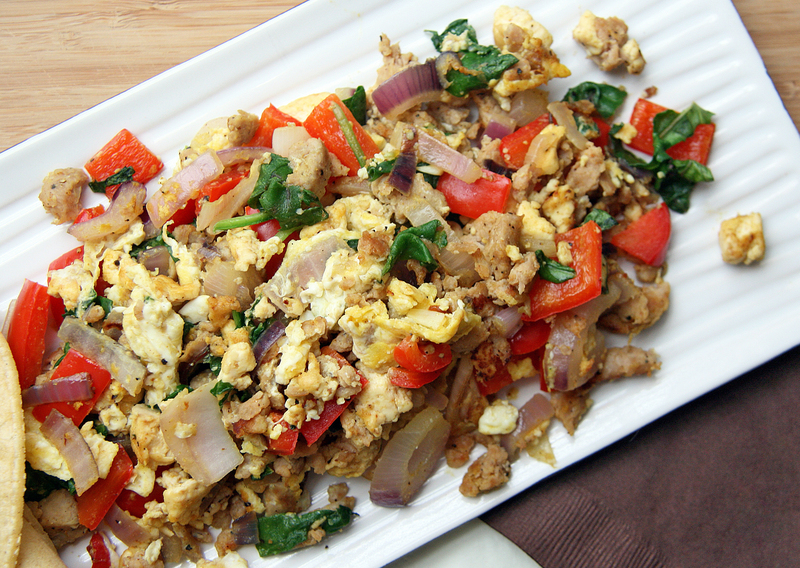 If you aren’t a fan of eggs, you can easily make this vegan by substituting crumbled tofu (and eliminate sausage as well). 1. In a medium skillet, heat oil over medium heat. 2. Combine chicken sausage, garlic, bell pepper and onion and cook for about 3 minutes, until onions are translucent. (If using tofu, add at this step as well). 3. Add curry powder and red pepper and cook an additional 1-2 minutes. Mix in greens and cook one minute until beginning to wilt. 4. Push veggie mixture to the side or create a hole in the middle and pour in whisked eggs. Let cook for 30 seconds, stir and cook for an additional 1-2 minutes until eggs are cooked through. Season with salt and pepper. Remove from heat and stir in nutritional yeast, if using. 5. 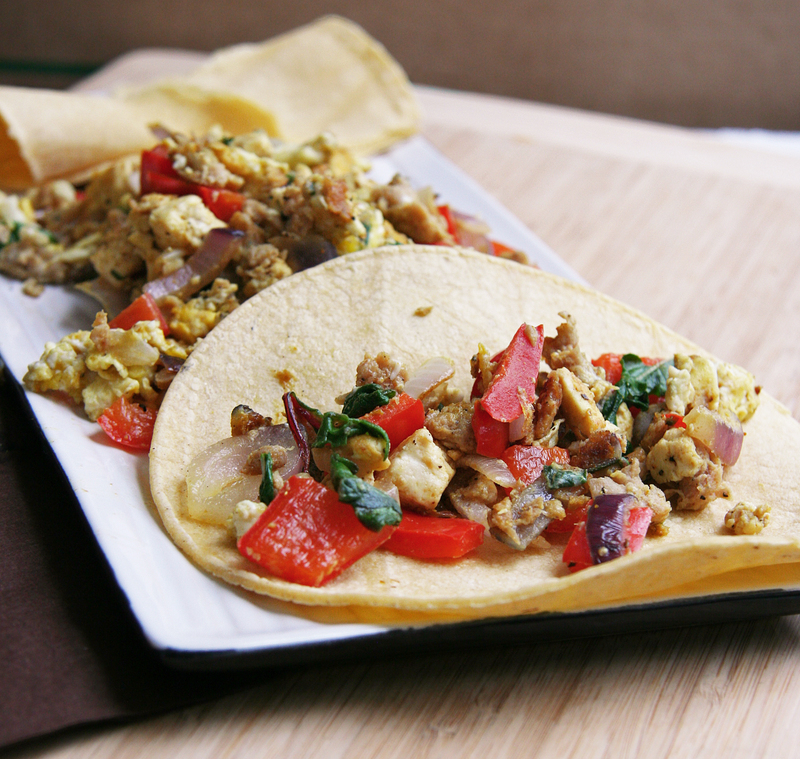 Serve alone as a scramble or in warmed tortillas as a breakfast taco and enjoy! OK i’m gonna be making this one for sure!!! Mouth-watering just thinking about it. Why am I thinking about our date when I see this? haha. Aaaaaaah, you miss me 🙂 hehe. This looks so good and easy to make! I have to put that on the menu for next week! SUPER easy 🙂 I hope you enjoy! I’ve also been adding a small handful of chopped walnuts to my scrambles, especially the tofu variety, LOVE the texture and flavor – yum, yum!